While filming for a commercial in Thailand on Tuesday, Andy Lau (劉德華) fell from his horse and was trampled on. The horse stepped on his waist and cracked his pelvic bone. His lower back was also injured. 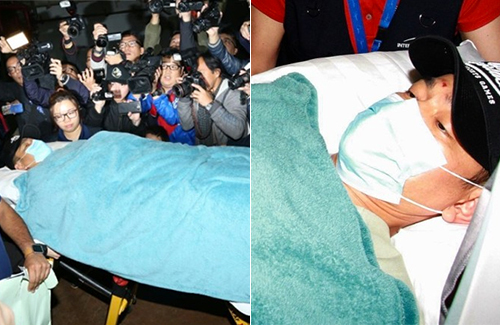 Andy was flown back to Hong Kong via air ambulance and arrived early Wednesday morning. He was immediately taken to the Hong Kong Sanatorium & Hospital in Happy Valley and was wheeled in on a stretcher. Andy was wrapped in a blanket, and wore a surgical mask and a cap. The scene was chaotic—reporters crowded around the actor, who looked like he was in pain. His forehead was slightly swollen. Andy was brought to a private suite room and was thoroughly examined. Sources say Andy is in stable condition and does not need to undergo surgery, but needs to remain hospitalized for further observation. It is estimated that Andy won’t expect a full recover until late summer to early fall. According to news reports, Andy’s emergency flight back would cost him about $1 million HKD. It is estimated that Andy would have to spend for $5 million HKD for his medical costs due to this accident. As Chinese New Year will be in a week, a source close to Andy said the actor is looking to get discharged by the New Year so he could spend the holidays with his family. Apparently, Andy did not want Carol to know about the injuries in order not to worry her. Andy should realize that a loving, caring wife Iike Carol has enough love, strength and courage to sustain her family. He looks so pity, hope he will recover soon. He should reduce dangerous scenes, he’s not young anymore. Riding a horse is common for actors / actresses and it is not supposed to be a very dangerous task if they know how to ride a Horse. But accidents do happen and, once in a while, they may encounter crazy or uncontrollable horses. Hmm not telling his spouse and letting her find out in the public news actually makes it worse. But I get his intentions. Read this on another site already. Very scary and just glad he is in stable condition. Hope he will heal with no issue! Wishing him a full recovery and no permanent damage. No money in the world will be more important than your health. They all need to be careful with their work – accidents do happen sometimes. Someone made this remark on another website: “Don’t follow others, lose their health to make wealth, and later lose their wealth to restore their health”. @dramas4me yup. really hope he gets through this and recover completely. Yes, wishing him a speedy and FULL recovery and no permanent damage. I grew up watching Andy and I hope that he can continue to act as he wants and not force to retire or do limited jobs due to health problem. He has a strong passion for what he has been doing and he is successful in his career. He also has a family he needs to take care of. Wish him well!! This is a serious injury. As long as his spine is ok.. I hope him speedy recovery.